Well, fellow cooks -- I can't tell you how excited I am to share our renovated kitchen with you today! During our first year of marriage, we took a Dave Ramsey course. After that, we started planing and saving so that when we were in a position to buy a house we'd have some money saved up to do some updating. 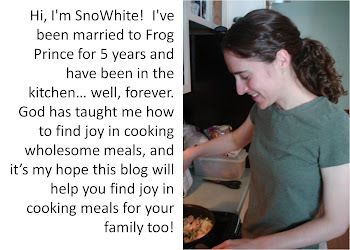 We fell in love with our house, and saw great potential in the kitchen. In August, we moved into our first home - a big change from our tiny apartment kitchen. Laminate front, dark and um, not the most pretty looking. Since we spend so much time in the kitchen, we wanted something light, airy and fresh. We painted the cabinets a Delicate Lace, painted two accent walls blue and later added some hardware. The access into the corner cabinet (just to the left of the stove) was painful. Since we planned to replace the counter top, we got my dad's help to swap in a lazy susan! Sea foam green, although a pretty color, is not our color. The old laminate counter tops had to go. We decided on a solid surface countertop - and we LOVE it. We went with a double sink, with one side larger than the other. It's amazing. That thing can hold so many dishes, and even fit in our biggest pots and pans. It's also seamless -- which makes clean up a breeze. We wanted tile, and found a beautiful one at Lowe's -- for, get this - ~20 cents a tile. We love the layout and flow of our home, but the kitchen was entirely closed off from the rest of the house. This is a view from the dining room to the kitchen. See that tiny door? That was the only "openness". We decided to transform this space into an eat-in kitchen. My dad built us a cabinet with amazing storage space, and then we put counter top over the cabinet with extra hanging over into the dining room for an eat-in-kitchen, island kind of thing. That, is my favorite part of the kitchen, friends. It's amazing. The openness is wonderful and allows for fluid conversation and for people to "hang out" near/in the kitchen. Thanks for sharing in our excitement! In the coming weeks, I'll give you a overview of what's in the kitchen - to kind of show you around a bit. 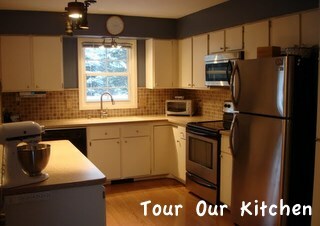 And, I'll be updating our "In My Kitchen" page to include these new photos and a tour! Beautiful! I love the tile backsplash and seamless sink...what am I saying, I love it all! Happy cooking in your new kitchen. Looking forward to see all the yummy recipes you share with us! the transformation is amazing!!! what a beautiful, open space! oh i love it and im so completely jealous! i now have 3 cabinets off our wall b/c of poor workmanship! i dream of a kitchen like that! Your kitchen looks awesome! My husband and I also took Dave Ramsey's course. We are currently still in our smaller place and waiting for the Lord's timing to move. I am dreaming of my some-day kitchen! Congrats on getting yours! LOVE your kitchen! I'm jealous of all your cabinet and counter space! Gorgeous, how wonderful - YOU SHOULD be so proud. WOW! this is so great! Love it! It's so nice when the construction phase is all over! Looks GREAT! Your new kitchen is set up EXACTLY how my new kitchen is....Island placement and everything. Ours is already open to the dining room though. I'm planning to do so many of the same things you did! Thanks for sharing your before and after's with us...it is so FUN to share in your excitement! This looks so great! I love all the colors and the openness of it all. Congrats on a beautiful space and the completion of such a huge job! I love it! And what great deals you seem to have found (like the tile!). Well done! We put a large serving window from our kitchen looking into our dining room in order to open it up as well and that has made a huge difference. Enjoy it! You guys deserve it! Absolutely beautiful!! Great job and congrats! Nice. We have the same faucet and love it!! Wow- I really appreciate the before pictures. You guys really had vision. congratulations. Great job!!! 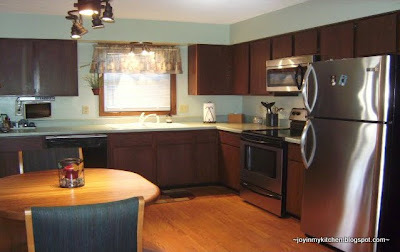 We have these same cabinets in our family room kitchen...they're in pretty decent shape, just ugly. I wasn't sure if we could paint them, but now that I know, it looks as if another remodel is in the works! I am inspired! 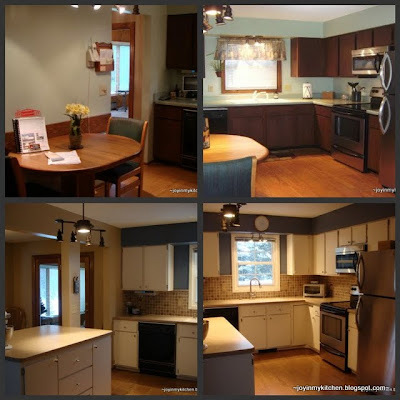 Enjoy your new kitchen~you deserve it! looks great!! love your colors! Beautiful! What a warm and inviting kitchen. :) It's a marvelous transformation. Wow! How exciting for you guys! That is so awesome. I LOVE the before and after picture! It looks so nice! Your new Kitchen is wonderful. I know how exciting it is to be finished with your remodel.You'al did a great job! Hope you are enjoying it every day! Wow! What a transformation! Looks awesome! How exciting for you both!! What a beautiful kitchen you created....a fantastic space to create some amazing dishes!! Thanks for giving us the tour! Fantastic! You really did such a terrific job. Well done! Gorgeous transformation! I love how you opened up the space, it looks like a fabulous place to cook! Beautiful Kitchen!!! I love all the changes you made. You should be very proud of how it turned out. Stunning! I love what you did with it and I love that you took the time and money to make the kitchen your own and so much more functional. Love it, love it, love it. Your new kitchen looks fabulous ... to die for! Congratulations to both of you on your new home and here's to lots of fun times in your new kitchen. oh man, that's awesome! i wish we could open ours up like that, but it wouldn't work without moving an entire wall of perfectly fine cabinets, and then switching the living room and dining room. oh well! great job on yours! Gorgeous! Visiting from Somewhat Simple. Come visit me sometime at SSB! It looks terrific! I especially love how you've opened it up. Way to go! It looks fantastic! The best part is that you paid for it all yourself without credit. I'm always a fan of that! What is a solid surface countertop? How does it compare price wise to other options? Your kitchen is really really nice! I must admit I have kitchen envy. One day hopefully mine will look just as nice. Great job! The backsplash really looks great! My husband and I still live in an apartment. I dream of the day of owning a big kitchen like yours. I would kill for that huge sink! Your kitchen looks amazing! 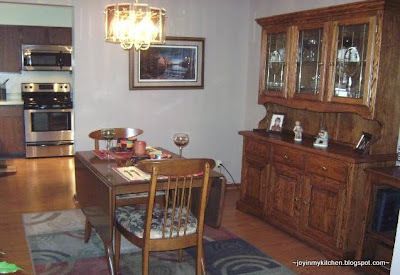 The way you opened it up to the dining room gives it a totally different feel. I also like that you didn't just gut everything but improved upon what you had. Great job! And a wise woman, too, to not go into debt over it! You have inspired us to redo our kitchen. We just sanded, primed and painted all our cupboards last week and put handles on and I am working on sorting out all the contents of the cupboards and putting new liner in -- we LOVE it. Thanks for the inspiration! Next, THE COUNTERTOP! I'm so excited to hear this! It's amazing what some paint can do to make a HUGE difference.